I had the Apple Strawberry Oatmeal like I did on Sunday for breakie. Just as good as before, if not better, I can't stress again how happy I am that it's berry season! For lunch I caught up wih Kristin who had crossed the border with out friend Tim this past weekend to Mendoza, a natural beauty of an Argentine city. I hope I can go soon! We ate at the school cafeteria (queue the boo's) and I settled for a salad with a hard-boiled egg and tuna. As expected it left much to be desired but the company was certainly well worth it :). Lastly, on the menu for dinner last night, was Pastel de Papas. However, since it wasn't ready in time and Isidora had come home with a friend that day, my host-mom reached for the emergency stash of frozen food. Vegetarian lasagna, yuck. Fortunately, all hope was not lost because the main dish was followed by an arugula salad, which was absolutely divine. And there you have it folks, Danielle's day of not-so-special and picture-less eats! Now onto the fun stuff! 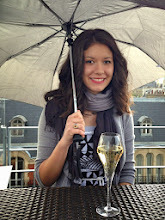 I was lucky enough to receive my second Brillante Weblog award... twice! First from the balanced healthy lifestyle blog of my intelligent B-Hlthy girl at Body. Mind. Soul. If you don't already know of her, you should! Not only does she make creative and yummy foods and share her workouts, but she also let's you in on that mind of hers making for a concrete source of nutritional information and thoughts. The second lovely bloggie who recognized me and this worldly culinary adventure was the inspirational and dedicated Sarah from See Sarah Eat. She lost 70 pounds through eating well, strength training and running. She's already run a half-marathon! A true example of the benefits of living mindfully and enjoying food and fitness. Thank you so much girls! I'm so lucky to be a part of such a wonderful and supportive blogging crowd and have enjoyed every minute of it! 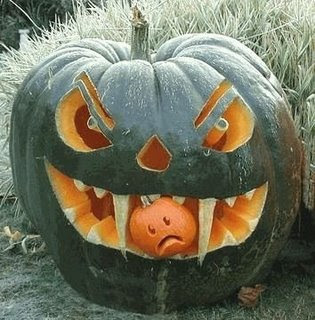 And now I will leave you with B-Hlthy's stand-in award... the scariest pumpkin of the week! :) In addition to a question: What on earth should I be for halloween?! With limited resources and time,any help would be greatly appreciated. Thanks, hope you all have a fantastic Tuesday!